Steve Allen of Taska Australia imported the UTVs for distribution throughout Australia. These machines were designed by Hamish Gilbert of International Machinery Ltd, Hastings, NZ. It was built in China but before you scoff, this thing is no toy. The Taska Stallion is a soundly engineered and well-built machine specifically built for the rugged NZ and Australian unique conditions. The machines are sold the world over is a bonus and a testament to its rugged credentials. They took the Taska to the Milan show in Italy and got orders for a 1000 machines. That’s a few years supply here. 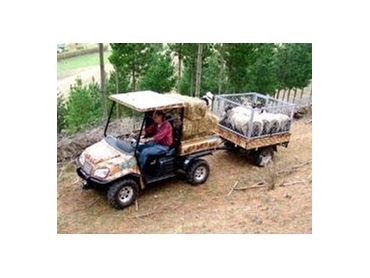 The Taska is a new generation of side by side vehicle (SSV) or UTV similar to a Kawasaki Mule or John Deere Gator. Steve has brought out the one model ‘Stallion’ for Australia. The Stallion is capable of a 500 kg payload with the heavy duty rear load suspension option and can tow up to a tonne when in 4 wheel drive and load braked. The Stallion UTV has substantial diffs, front and rear, again taken from the little Suzuki SJ410 series trucks, so are robust. The Taska has added benefit of CV joints in the axles, which copes with the impressive travel of the independent rear suspension. From the transfer case, drive shafts are straight to the diffs. The front suspension set-up is McPherson struts, same as the car. Polaris have used them for years. Steering is rack and pinion. All this is surrounded by a box section chassis with a very strong rear design incorporating the deck and suspension mounting. If anyone breaks one of these, I would certainly be asking what they were doing with it. Brakes are substantial discs all round, with a cable-operated handbrake. Climbing aboard the machine, there are bucket seats with seatbelts, and the 4WD selector, handbrake and gearshift between. A full dash gives all the necessary info, such as speed, fuel, oil and water along with a charge light. There is a good sized glove box and a lockable box underneath the drives seat. Switches on the dash are for the full automotive type lights and the front mounted winch (optional). The Taska UTV comes with indicators also, helping the safety aspect. The winch incidentally can be shifted by pulling a couple of pins, and mounted on the rear of the Taska UTV. This machine is a quiet runner. The Taska UTV will happily start in 2nd gear on flat ground, and once one has the hang of the gear box it is dead easy. The Stallion UTV has a top speed of 64 kph. The machine works very well on steep hill country with the manual transmission where you can rely on the motor to hold the machine back from running off. The machine is impressive in its capability. Stability is awesome, helped in no part by the 1.9 metre wheel base and 1.23 metre track. Size wise it is similar to the Polaris Ranger.Ground clearance is an impressive 230 mm. With limited slip diffs traction is at an optimum in all weather and track conditions. The Taska UTV currently is all red in colour in Australia and at a premium price when compared to the Quad and their load and passenger capabilities. The Taska UTV is definitely a machine to consider because here is a machine that is robust, well built and engineered, safe and built to last.